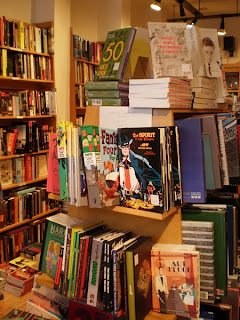 Rob said: "Sandpiper Books are easily located amongst Brighton antique and ‘alternative’ shops. OK so this one is not full of crusty musty books stored on high shelves covered in antique dust but it does offer a very varied selection of remainder and bargain books at very reasonable prices. The back room is stacked full of bargains all priced at one pound. I found a Norman Lewis which I had been looking for. All subjects from philosophy and history to cookery with art and design a specialty. The very knowledgeable and friendly owner then located Paul Preston’s ‘We Saw Spain Die’ another of my wanted list for which I paid a very reasonable 7.99. I was only stopped from buying more by a certain airlines miserly baggage allowance. Well worth a look." Sandpiper Books, an independent bookshop founded in the late 80s, is a nice example of how an independent bookshop can remain competitive even in the internet age. This bookshop combines the irreplaceable pleasure of book browsing in nice surroundings with the offer of books at very affordable prices. Bargain books and discounted remainders are the bookshop's specialty, but unlike many other bookshops from this field of business, Sandpiper Books also pays great attention to the way the books are presented. So if you've been searching for an out-of-print book for quite a while you may be surprised to find it here at a bargain price. The small room in the back offering everything for one pound offers sufficient proof that good deals are really common at Sandpiper Books. As for the stock, it is strong in non-fiction titles, especially in art and design books, but also history, philosophy, architecture, biographies and lots of other fields. The quality of the stock, a nicely organized and well designed bookstore, helpful knowledgeable staff and at last but not least - prices well below standard, all make up for a bookstore which has the power to attract a wide variety of satisfied customers. It also presents an interesting business model which shows independent bookselling an alternative worth exploring. The only objection we have is that Sandpiper Books has practically no online presence which seems like a wasted opportunity. Wow this post is very tempting for a book worm like me. What I like about this compact city, are its quieter beaches. Not only main Pebble beach but all sands and stony beaches there are full of fun, you can have there lazy days in sunny weather. I am searching for an online Brighton Guide about beaches.